Last week while I was out our local “outdoor” store, Outdoor Gear Exchange, I picked up a few different items to help power me through the longer mileage I’ve got coming up. 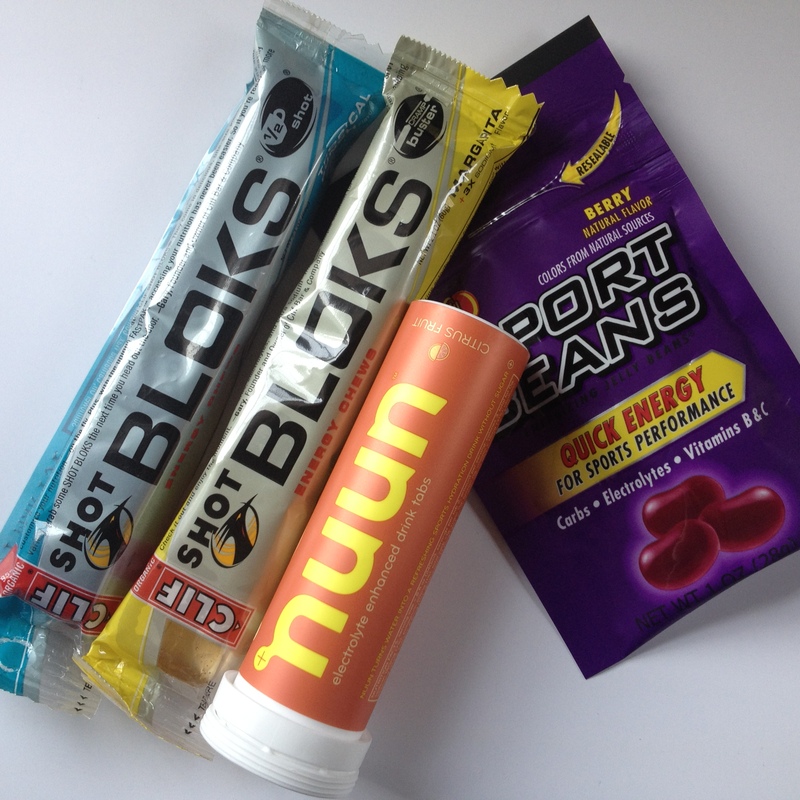 I grabbed some Nuun, Clif Shot Bloks, Sport Beans and GU (not pictured because I totally forgot I bought it!). They were actually having a buy 5 get 10% off deal, hence the 2 different flavors of Blocks. I intend to give a brief review of each as I use them, and I decided to start with GU. Stayed tuned for upcoming Fuel Review posts. According to the company’s website, GU contains Carbohydrates, Electrolytes, Amino Acids and Caffeine, to provide optimal nutrition for athletes, allowing them to go longer and faster. Directions for usage are to consume 15 minutes before a workout, and every 45 minutes during the workout. I have actually used (that is to say, eaten) GU before. My friend Krissy and I used to roller-blade from her house in South Burlington all the way to North beach in the North End of Burlington. I just measured it today using Map My Run, and it was actually about 7.5 miles! We would always stop at the Ski Rack downtown to ogle the fancy new roller blades and buy chocolate flavored GUs, cause they were kind of like chocolate fudge. We didn’t really use them for “fuel,” although knowing now that our route was almost 8 miles, it’s actually probably good that we ate them! I haven’t had any since about, oh, 10th grade, but I’ve always had a soft spot for GU. My long run on Sunday was 8 miles, the longest distance I’ve ever attempted. I ate my GU at approximately the halfway mark, which was about 45 minutes into what was an hour and a half long run. I also chose this point in my run because I was strategically near grocery stores with public restrooms, my office, and my friends’ apartment, in case something went terribly wrong in the GI department. I ate it somewhat slowly, over the course of about 1/4 mile, and sipped lots of water along with it. I think it helped that as I was finishing, I got stopped at a long light waiting to cross a busy intersection, so I had a minute to drink some water and get it all down. I might consider using GU again, but I’m definitely going to wait and try all of the various options I purchased before buying more GU. Hopefully I can find something that doesn’t give me any pukey feelings. I also used Nuun on this run, but it’s hard to say how effective it was. I intend to use it a few more times before reviewing. Have you ever tried GU? What’s your favorite long run fuel? Yikes, only 4 days till your race! You may want to try bringing actual food with you that you’ve eaten before and you know doesn’t make you sick. I’ve heard fig newtons can work. Also raisins or craisins. You can put them in little baggies to make your own fuel packets. I am a big GU fan. The key to it for me though is that I have to have it on an empty stomach and only mix it with water. It’s my fuel of choice for shorter distance runs. When I know I’ll be out there a lot longer, I carry Luna protein bars. That’s a good idea. I’ll have to give it a try!